Thank you Bee Chavez for the tip! I am dogged by the luck o' the Irish (bad luck) when it comes to getting invited to food tastings and freebies all these bloggers I read about get to enjoy, but then again I never was and never will be a food blogger. I just like to eat (and write about it if and when the food, whether good or bland, induces some inspiration), that is all. And so I have abandoned all freeloading hope. Then out of nowhere (not exactly nowhere, but by some six-degrees-of-separation kind of luck) I get to take part in an Irish Pub's food tasting. Like a leprechaun who has found a pot of gold, I leap with glee. Woohoo! 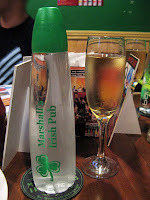 At Marshall's Irish Pub, a long table was set up with green-capped bottles of water and flutes of champagne waiting for the tasters. 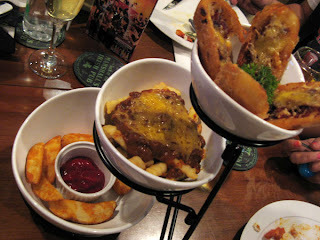 It started off on a high note (who wouldn't be excited to taste Irish Pub fare for free?) 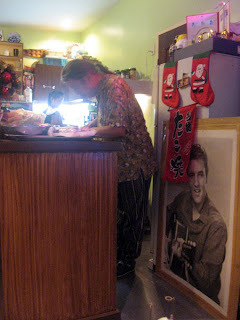 with Larry Marshall, evidently the owner of Marshall's Irish Pub, taking the singer's seat by the entrance with a microphone in hand (the pub has live acoustic music every night at nine). Not to sing but to welcome the invited guests and to talk about how the pub came to be and what is served here. Marshall's Irish Pub possesses a 75-item menu featuring the many ways you can have your potatoes (the Irish equivalent to rice) and some not-your-everyday restaurant food, such as crocodiles and ostriches. We don't normally encounter crocodiles and ostriches in menus around Cebu, but at Marshall's Irish Pub it is also proudly announced on each table. The pub's food tasting extravaganza, which we later on realized really was an extravaganza in the true sense of the word, started off with the appetizers. Five appetizers served dish by dish. The platters were tasty. 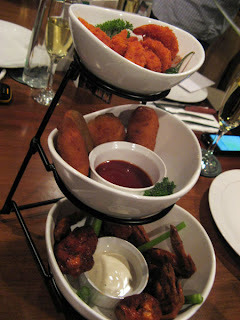 I like spicy food so the Hot N Spicy platter (Php 665), especially the jalapeño poppers, is my favorite of the batch. 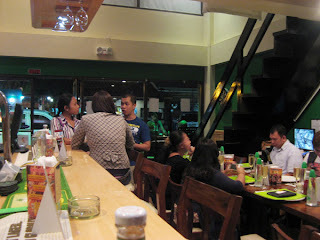 Then it's a tie between the Potato Platter (Php 340) and Seafood Platter (Php 685). 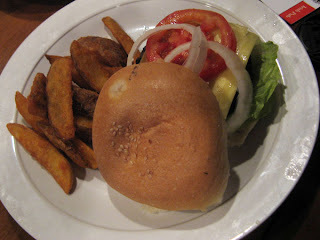 The Pub boasts of serving fries that come from the US. It does taste better than the fries you get from fast food restaurants here. Although I don't mind what country the fries come from, one thing's for sure, my appetite isn't xenophobic. 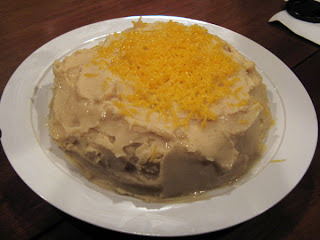 Moving on, the potato skin was a fairly new twist to potatoes. I'm liking the idea that the cheese and ground meat made it look like a slice of pizza. The chili cheese fries tasted less spicy, or maybe because my taste buds tolerated the sting since I had jalapeño spiciness still lingering in my mouth. The wedges were also good, but I can't rave about it now for I have tasted the Pub's potato wedges a couple of times before. The Seafood platter did get a lot of good murmurs from the other tasters. 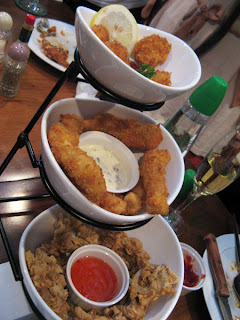 The fish sticks were soft, and the fried shrimp was tasty crunchy. 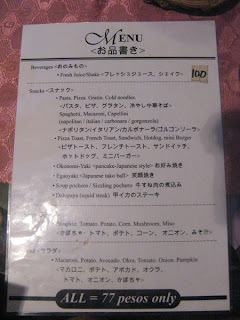 I hesitated to try the calamari since I'm not fond of munching hard rubbery food. But theirs was soft and chewy. The only negative comment I heard was that the calamari was "near raw". My first time to eat croc meat. 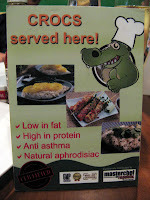 The crocodile bites (Php 395) taste like fish but with a consistency nearer to pork minus the grease. I overheard that the best part of crocodile meat is its tail. Before I forget, the calamari and crocodile bites were beer-battered using the famous Irish Guinness Beer. I like shrimp. 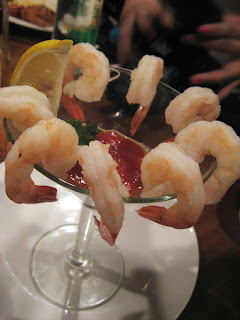 I love shrimp. 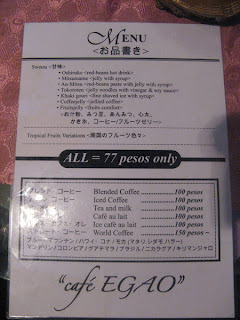 Unfortunately, the shrimp cocktail (Php 345) did not appeal to me. Enough said. 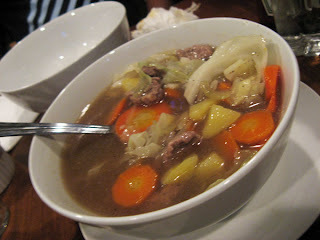 I found the Irish stew (Php 495) very peppery but it worked for me. The lamb in shepherds pie (Php 695) was tough...or maybe I was just lucky? Lucky to have picked the tough piece. I was never fond of lamb so I might be biased here. 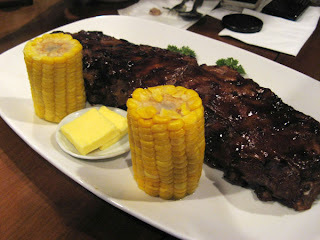 The baby back ribs (Php 990 for a full rack, Php 495 for half) was...okay. By that I mean I've had better. 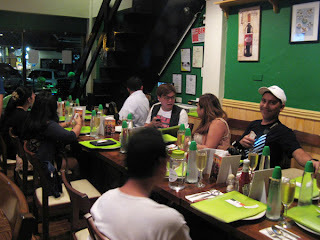 When Larry announced there was more on the way, the high note slowly dwindled to a less enthusiastic murmur from the bloggers around me, not because the food was unpleasant but because it was too much. Stomach gauge needles were now dangerously near the full mark, and the pub was barely halfway thru with serving the main courses (they were serving us ten main courses on top of the five appetizers!). Larry, the owner, should have warned us a day or two before, and we could have skipped breakfast and lunch on food tasting day. By this time I could only take in one-inch square of each. 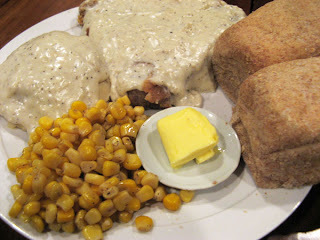 First, the one-inch square of country fried steak (Php 695). I liked its gravy and the wheat bread was wonderfully fluffy. 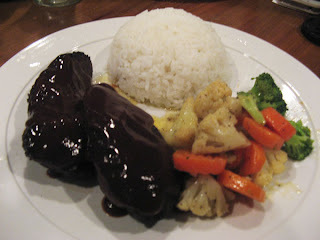 As for the supposed star of this dish, the beef tenderloin steak, hmmm...it wasn't too tender if you ask me. At this point, please do not trust my judgment. I am near the full mark and cannot fully relish the bounty before me. 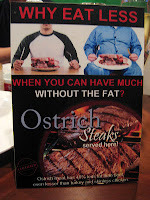 The ostrich steak (Php 695) and the ostrich burger (Php 425) made me appreciate ostrich meat, but my pockets, if I get ostrich meat cravings, will hate me for this. It is expensive. 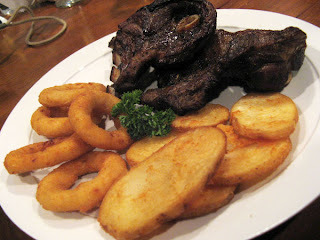 The lamb chops (Php 695) were fine; I liked it better than their baby back ribs, though I shouldn't compare pork and lamb. 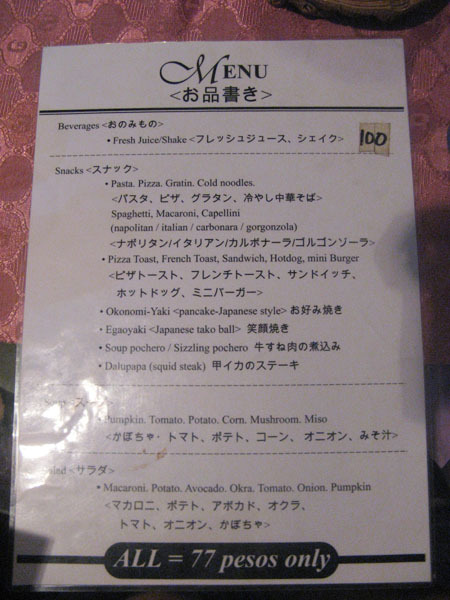 The last four dishes served were sandwiches, all paired with potatoes. 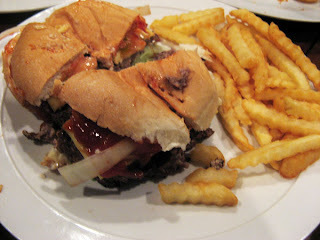 The shamrock cheeseburger's (Php 395) a hefty 1/3 pound of ground beef. 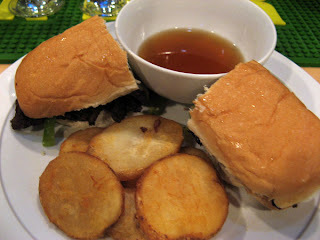 The dip of the Ireland dip sandwich (Php 595) is beef broth. 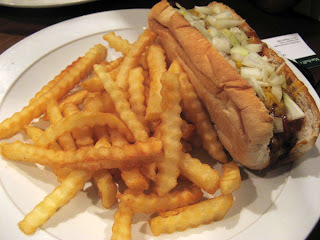 Chicago chili dog's (Php 245) hotdog is pure Angus beef. There were some hits and some misses in terms of taste. For the price, the Pub's not for me, an average-earning worker. I found everything too expensive. But, hey, the servings are huge! Platters, of course, were meant to be shared among four persons. The stew, shepherd's pie, and full rack of ribs looked like it could feed up to four. The rest can be shared by two. Lastly, since this is a pub we are talking about, I should mention that Marshall's Irish Pub has more than a dozen imported beers on the shelf. If you're one who doesn't stray from local beer, those are available too. Drop by for happy hour from 4PM to 7PM for discounts on selected local beers. If beer isn't your drink of choice, the pub's got your back. Would you like a cocktail, mixed drink, liquor, or wine, lad? Zero. Nada. Nil. Thank you Marshall's Irish Pub for the colossal treat. 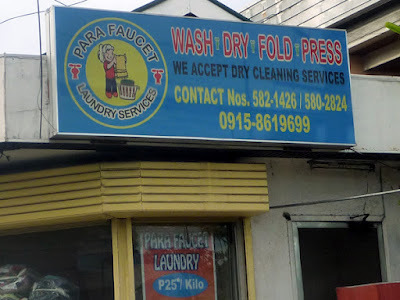 According to my calculator, for the hefty food alone (10 appetizers and 20 main courses for the entire party), it would have cost about Php 18,500 including the 10% service charge. This wasn't meant to be devoured in one sitting, but I could not help read page after page of absurd and amusing travel tales. I would not recommend this for people who are afraid of having something go wrong while they're traveling. This book is full of all the possibilities (and impossibilities, or so we thought) you would not want to happen while traveling. Best not to read this while waiting for your boarding call or while on a flight to somewhere. Leave this in the bathroom: read it while sitting on your throne and have a good laugh. You with your nose scrunched up: Ah phooey! Another food post. Mustachio with a sheepish grin: Sorry, the brain cells in charge of travel have been hibernating. No, I haven't turned into a full time food blogger. I leave that to the experts! I'm an expert at stuffing my face with anything that looks edible but with my limited foodabulary and my need for a tastetionary, I will never be a connoisseur of food. You: What did you stuff yourself with this time? 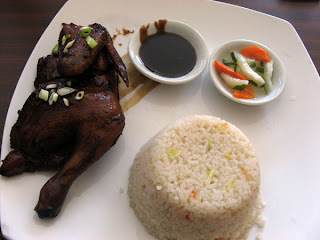 Mustachio: Soy chicken and rice from Ah Phets in Green Orkid Commercial Complex on Escario Street (Cebu City). It's a no frills noodle house that also offers rice toppings. Oh, and I had a forkful of beef brisket noodles, too. You with an eyebrow raised: Just a forkful? Mustachio: It's rude to eat everything on somebody else's plate. Somebody else's bowl I mean. You looking surprised: Ah, you had a date! Mustachio: It's boring eating alone. With a date, I can rant or rave about the food on the spot. Without one, I have to suffer in silence. Literally suffer if the food's heinous. You: Did you rant or rave over your meal? Mustachio with a poker face: Neither. My soy chicken was tender and it wasn't dry, that's the good part. The taste was just so-so. 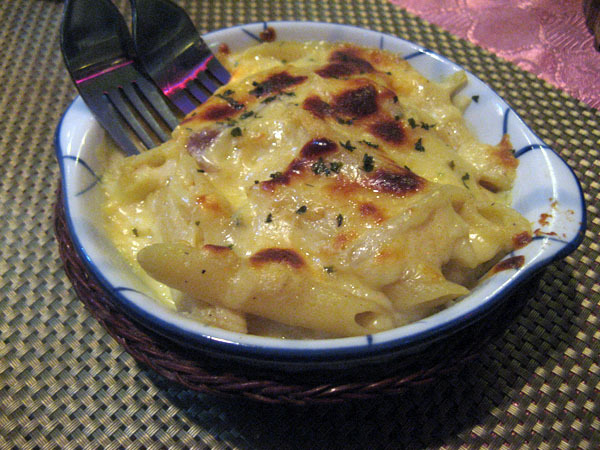 You: How about that forkful of noodles? 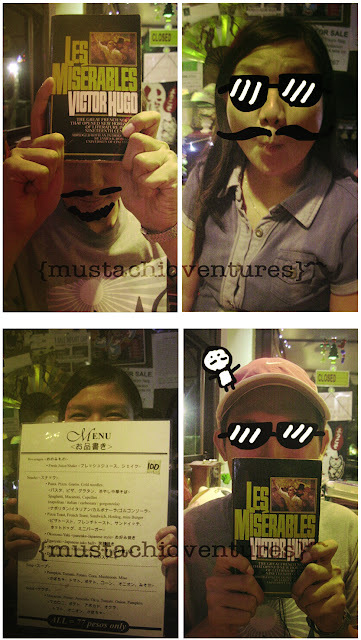 Mustachio: It somehow reminded me of Chowking. Is that good or bad? You: No comment. 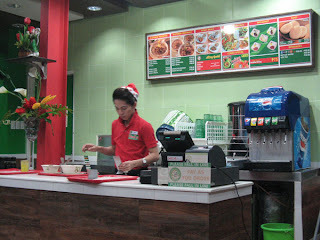 I don't eat at Chowking. And the broth? Mustachio: My date, the owner of that bowl of noodles, found it rather weak. Mustachio: Don't take my word for it. 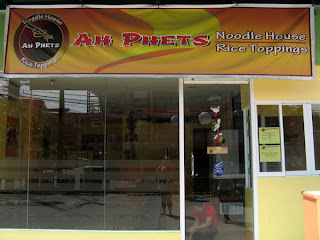 Ah Phets offers other dishes too and I have only tried these two. 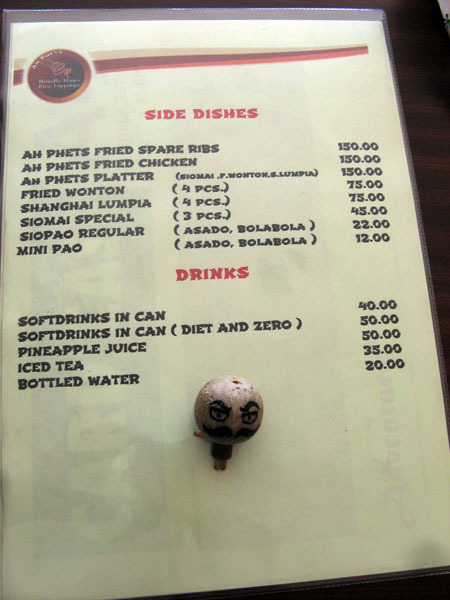 I read somewhere that their siopao's delicious. But we don't have the same taste buds, what may be delicious for me might be ho hum for you, and vice versa. 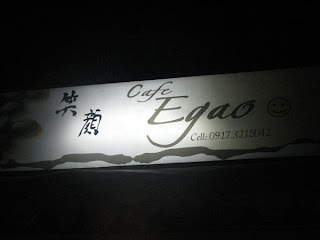 This cafe better live up to its name, Egao 笑顔, which means smiling face. 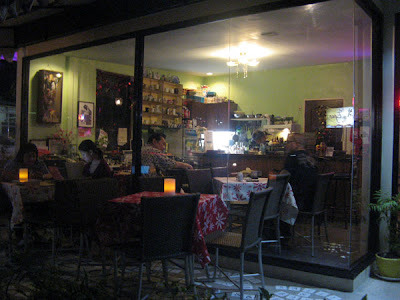 Cafe Egao is a tiny (can only accommodate less than 20 customers) and homey (gives you a sense of organized chaos when you step inside) coffee shop in Nasipit, Talamban, whose spread isn't limited only to cups of coffee (Php 100-150) but includes soup, salad, pasta, snacks, and desserts (Php 77-100). 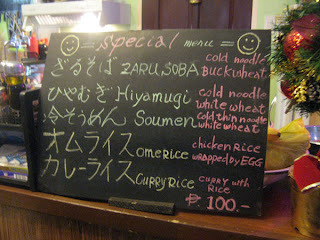 And then there's the occasional noodles and rice meals. 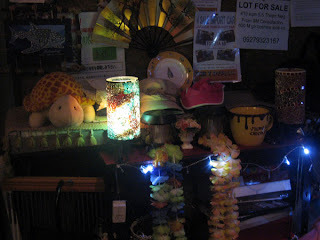 While waiting for your cup of coffee, there are knickknacks and thingamajigs to keep your eyes busy. 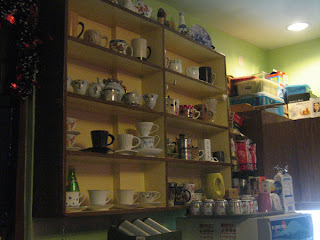 Books and magazines, though most are in Japanese, are also piled on the side for your reading (or skimming) pleasure. 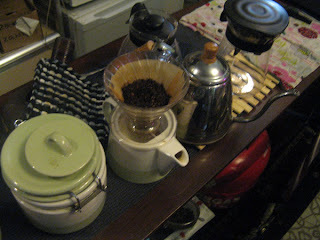 You can also poke around the cafe, look but not touch their coffee corner, or sit still and keep your thumbs busy connecting to their WiFi on your phone or whatever gadget you have on your person. 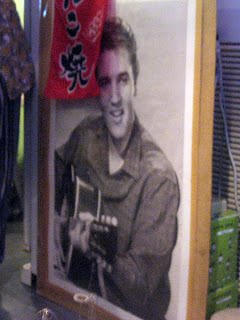 Or admire Elvis Presley as he silently serenades you while the Japanese owner prepares somebody's food. 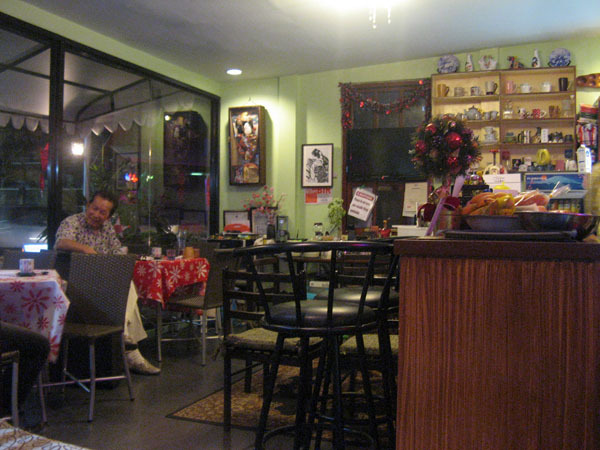 By the time you finish exploring all the nooks and crannies of the cafe, the food will have arrived. 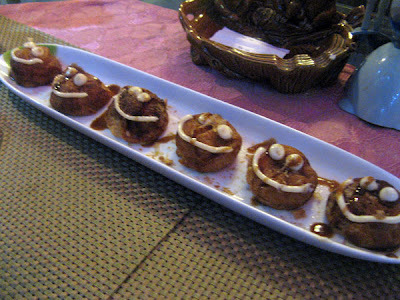 Six takoyaki balls all sitting in a row, smiling. These tako balls are aptly call Egaoyaki. 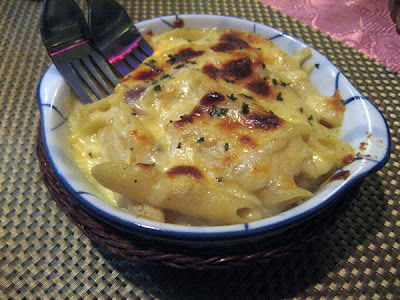 Then the hot, fresh off the oven, gratin. Cheesy. Creamy. But not overpowering. This will give a person who doesn't like pasta second thoughts. 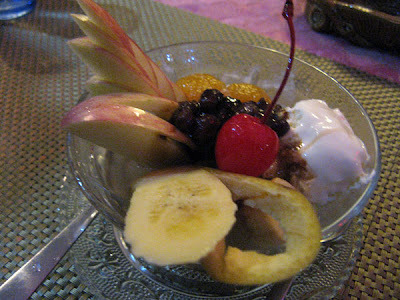 And, to cap off the meal, a lovely bowl of anmitsu - a delectable dessert of red beans, fruits, vanilla ice cream, and jelly in syrup. Cafe Egao indeed lives up to its name. Here are two happy and smiling customers as proof. 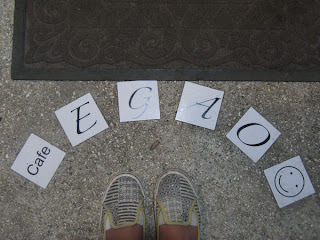 ...with a smile from top to bottom. 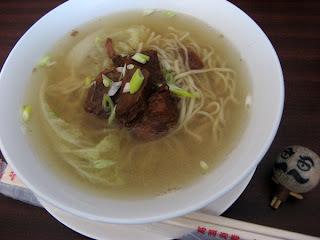 Who hasn't heard of batchoy? Raise your hand. 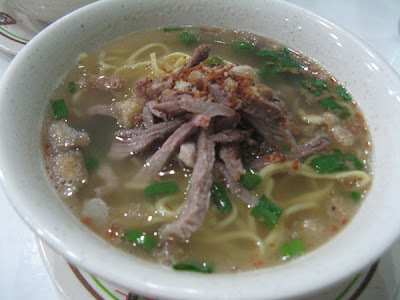 According to wikipedia, batchoy has been around since the late 1930s, originating from La Paz, Iloilo City. 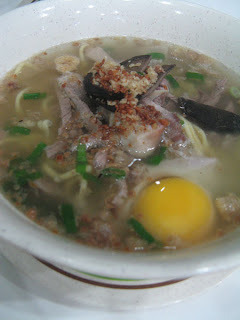 If you haven't heard of batchoy, it is time you crawled out from under your rock. There are only two places in Cebu that I know of that offer batchoy: Carlo's (last time I had Carlo's batchoy was maybe five years ago!) 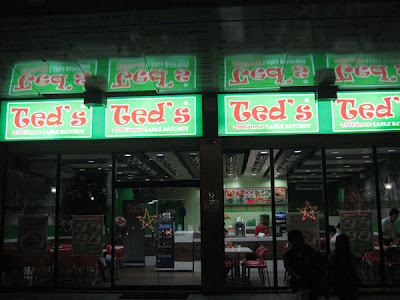 and Ted's, which I spotted only recently at APM Mall, across SM City Cebu. The batchoy I know has miki or egg noodles, pork, chicharon (fried pork skin), and the optional pork liver and pork intestine. At Ted's they have beef, miswa, and sotanghon batchoy. 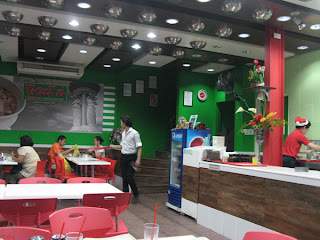 They also have breakfast meals available all day, and four meal choices that come with a small bowl of batchoy. 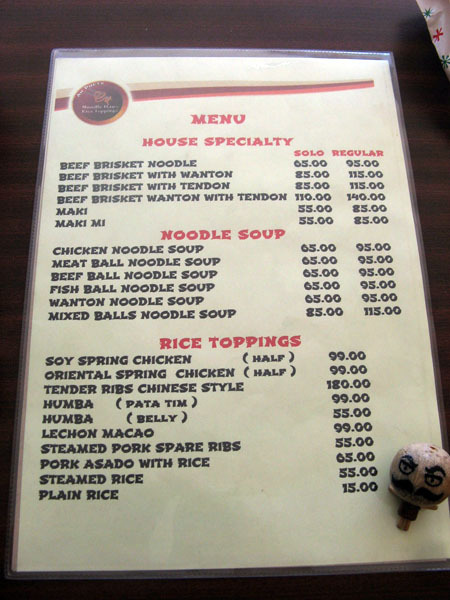 Click on the photo below for the full menu. I got batchoy with the works or "extra super batchoy" as what it's called at Ted's. 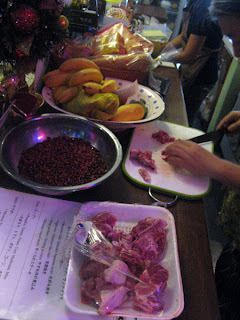 It has pork, liver, intestines. And for 10 pesos more, an egg. Batchoy buddy just ordered the "special batchoy", no liver, no intestines, no egg. Because she is boring like that (her words, not mine). Call me picky but I have some issues with Ted's batchoy. 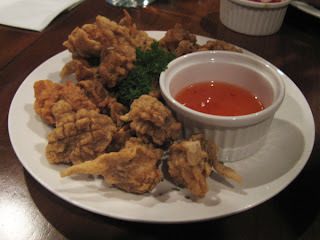 One, Ted's too stingy with the chicharon (look! you can barely see the chicharon). 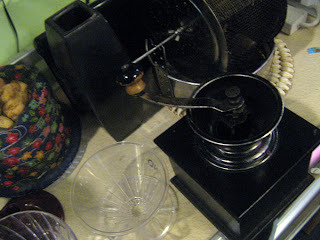 Two, the hardly-there chicharon was hard. Three, the intestines look like it had some kind of disease. 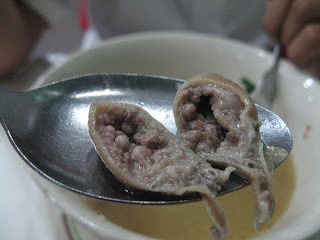 Sickly looking intestines...makes me sick just looking at it. But the broth, oh, the broth, was its saving grace. It was delicious. I drank it all like a fish. 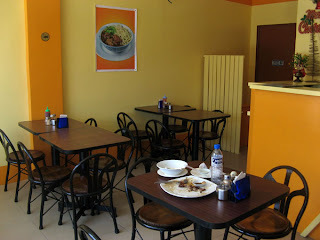 Woe is me, I haven't been to Ted's original branch in La Paz, Iloilo...this would have been a "Batchoy vs Batchoy" post.